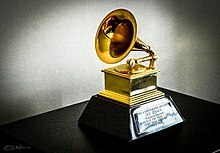 For many years, the Grammys were usually held on the second Sunday of February, with two exceptions: if that day was February 14 (Valentine's Day), it was moved to the following day; if it was a Winter Olympics year, it was held earlier on the last Sunday of January. Starting in 2020, the Academy Awards ceremony will move back to the second Sunday of February, forcing the Grammys to move back to the last Sunday of January to avoid a conflict with either the Oscars or the Super Bowl on the first Sunday in February. To allow sufficient time for preparation, the cutoff date for eligible recordings will move from September 30 to August 31. This change means the eligibility period for the 2020 awards is eleven months (October 1, 2018 – August 31, 2019), a month shorter than usual. ^ Lewis, Randy. "With 2020 Grammy Awards moving to January, eligibility deadline is pushed up a month". latimes.com. Retrieved April 24, 2019.